The students could attend a talk on "Flexible and nano electronics" given by Marta Mas-Torrent, researcher at the ICMAB, and paticipate in a roundtable entitled “Why study Nanoscience and Nanotechnology?” conducted by Master, PhD and young project managers who coursed the nanoscience at the UAB. The speakers explained their experience and answered the questions posed by the students, so different backgrounds and diverse future possibilities were shown, to let the students know that nanoscience could be found in a variety of career paths. Ona Segura, master student at the UB who is conducting her project at the FunNanoSurf at the ICMAB, was part of the roundtable. The studends could also visit the organizing research centers (the ICN2, the ICMAB, the UAB Faculty of Sciences and the IMB-CNM), who showed them that nanoscience and nanotechnology have already entered our lives and change the way we live, through a variety of talks, workshops and laboratory visits. 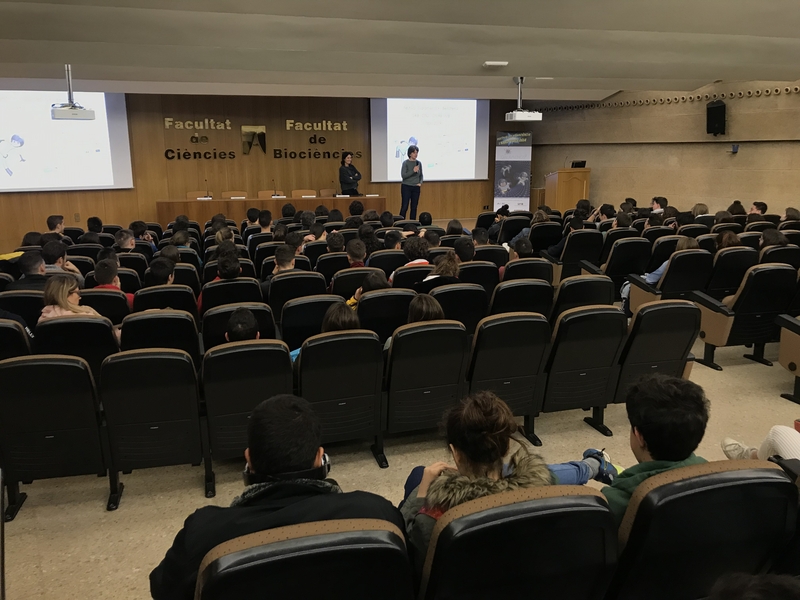 At the ICMAB, they could visit the Nanoquim Platform, the AFM lab, the SEM lab and the SoftLab, and Anna May Masnou and Arántzazu González gave an introductory talk on nanoscience, nanotechnology and nanomaterials at the ICMAB. This is the main goal of this festival: bring nanoscience and nanotechnology closer to the public. 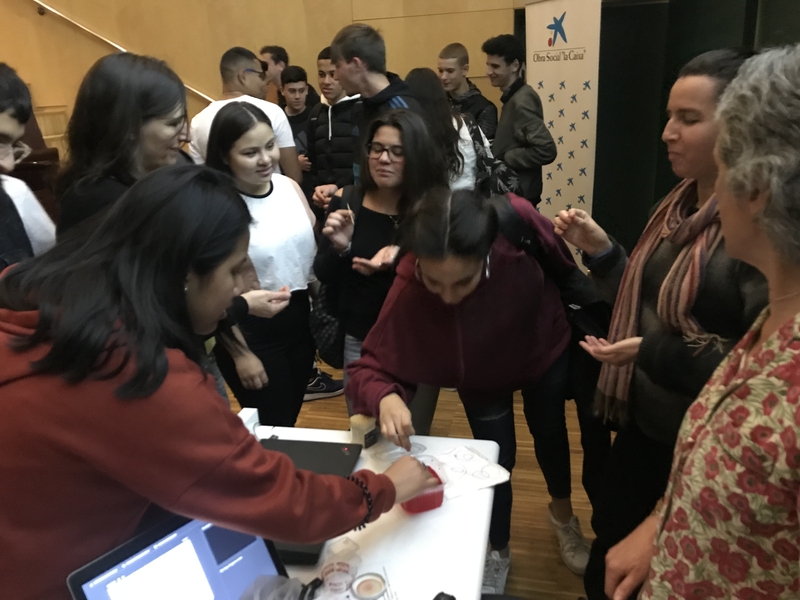 The festival kicked off on 8 April at CosmoCaixa with a series of engaging talks, activities and workshops to disseminate the knowledge generated at the nanoscale and its applications. From the ICMAB, Anna Roig and Ángel Pérez participated in the seminars and interviews open to the students. Anna talked about bacterial nanocellulose and its applications, and Ángel talked about nanoscience in the energy field. Our Matheroes were also present at the Festival, for the Nanochallenge activity. The Matheroes represent five materials with superpowers: Fotoenergy, converts solar light and heat into electrical energy; Superconductor, can levitate and transport electricity without resistance; Magnon, can read and store information, Electrowoman, has flexible long arms, is transparent, and can adapt to the surface, and BioNanoCapsule, a biodegradable and biocompatible nanocapsule for drug delivery. The activities spread throughout all Spain with events taking place in Madrid, Sevilla, Málaga, Valencia and many other venues. 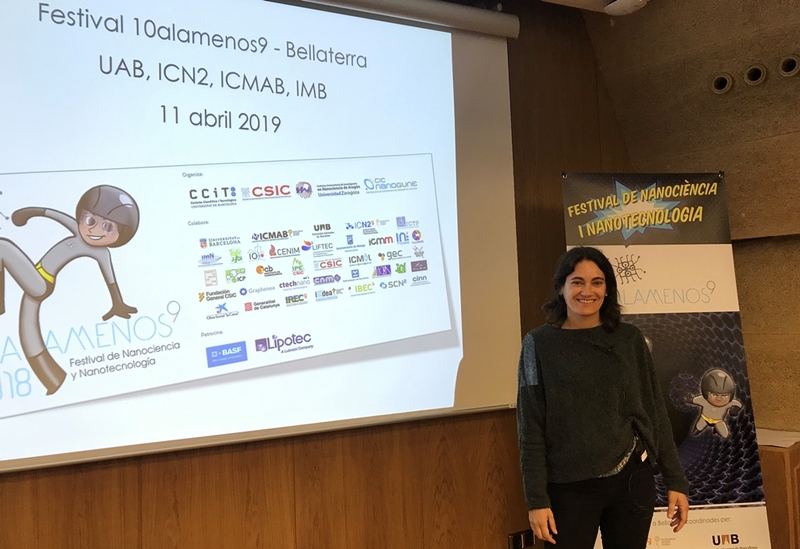 The 10alamenos9 will end with the 5th meeting of "nanodivulgadores", communication experts specialised in nano, on 26 April in Madrid. We are already looking forward to the next edition of the Festival!